This stunningly original, kaleidoscopic novel is an inspired celebration of women reading and the artists who have caught them in the act—“a vivid portrait of a timeless subject” (Minneapolis Star Tribune). A young orphan poses for a Renaissance maestro in medieval Siena. A servant girl in seventeenth-century Amsterdam snatches a moment away from her work to lose herself in tales of knights and battles. An eighteenth-century female painter completes a portrait of a deceased poetess for her lover. A Victorian medium poses with a book in one of the first photographic studios. A girl suffering her first heartbreak witnesses intellectual and sexual awakening during the Great War. A young woman reading in a bar catches the eye of a young man who takes her picture. And in the not-so-distant future a woman navigates a cyber-reality that has radically altered the way people experience art and life. Each chapter of Katie Ward’s novel immerses readers into the intimate tales behind the creation of seven portraits by artists, ranging from Simone Martini to Pieter Janssens Elinga to a Flickr photographer. In gorgeous prose, Ward explores our points of connection, our relationship to art, the history of women, and the importance of reading. Dazzlingly inventive, this is “a fascinating testament to the universal themes of art and literature and the spirit of femininity” (BookPage). This reading group guide for Girl Reading includes an introduction, discussion questions, ideas for enhancing your book club, and a Q&A with author Katie Ward. The suggested questions are intended to help your reading group find new and interesting angles and topics for your discussion. We hope that these ideas will enrich your conversation and increase your enjoyment of the book. In this delicately crafted and richly imagined novel, Katie Ward conjures up the backdrop, characters, and stories captured in seven portraits of women reading throughout the centuries. Told in seven chapters, Girl Reading breathes life into static art and creates entire worlds for the stories’ subject—from a young orphan posing for a religious painting in 1333 to a weary, career-minded woman being photographed in a bar in 2008. 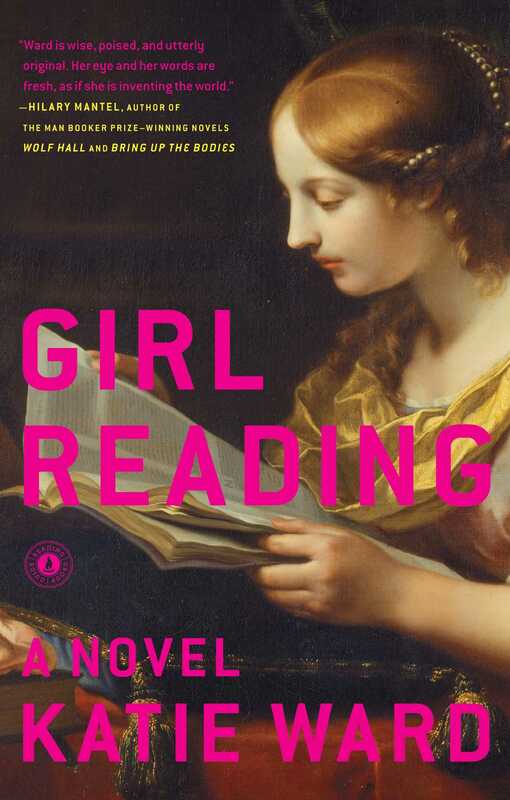 In Girl Reading, Katie Ward takes readers behind the canvas and into the yearning, painful, secretive, and hopeful lives of women who read, and the artists who capture them in the act. 1. Have you read any other books that tell stories inspired by works of art? How do each of the writers use visual art as a springboard for their fiction? 2. Girl Reading has a unique structure—the book is comprised of seven chapters, each inspired by the creation of a different piece of art in a different century. What does this particular structure bring to the book? What is the cumulative effect of these chapters? 3. What do you think Ward was looking for when she picked (or created) these seven works of art? Did you look up any of the pictures or paintings? Why or why not? Visit Katie Ward’s website at http://www.katieward.co.uk/?page_id=52 to see the paintings and photographs that inspired the novel. Do you think it is necessary to see the portraits in order to fully appreciate the stories? Did looking at the portraits add to your understanding of Girl Reading? If so, how? 4. How did Ward’s writing style change as the chapters moved forward in time? 5. Ward weaves in references to previous chapter paintings on several occasions throughout Girl Reading. What specific examples of these artistic references did you notice? How did they inform your ideas about the book? 6. Ward quotes Carl Jung in the book’s epigraph: “You can never say with certainty whether what appears to be going on in the collective unconscious of a single individual is not also happening in other individuals or organisms or things or situations.” Why do you think Ward selected this quotation? How does this quote frame your reading? 7. Reflect on the rules and constraints imposed on artists throughout the book. Take, for example, the rules given to Simone Martini by the bishop on the bottom of page 6. Do you think that constraints necessarily inhibit creativity? 8. Discuss how technology has affected and changed art over the centuries—from Simone Martini creating pigments with egg yolk to Sincerity Yabuki digitally rendering Sibil in mesh out of computer programs. 9. In the “Portrait of a Lady, 1775,” Angelica Kauffman observes that “the soul is the true likeness” in a painting. (p. 115) Ward adds, “She gets it, holds it and, incredibly records it…this is Angelica’s gift.” (p. 116) How did this idea of capturing the subject’s soul in a painting evolve throughout the book? 10. How did the relationship between artist and subject change throughout the book? Which artist-subject relationship felt the most strained to you? The most illicit? The warmest? 11. Each chapter in Girl Reading deals with love, in some way—love blooming, love slipping away, love lost. In which stories do you feel the artistic process was most full of love? Do you think that painting or photographing someone is always an act of love? 12. Do you think Girl Reading is a feminist book? In what ways? 13. How did the roles of women (and women artists) in society evolve throughout the book? Discuss the social constraints and expectations on each of the women portrayed. In which chapters do you feel the women were most liberated? 12. Turn your attention to pages 300-305 and re-read Sincerity’s explanation of Sibil’s genesis and capabilities. What exactly is Ward trying to communicate to her readers? What does Sibil represent, and what is her purpose? What other meta messages did you pick up on in the last chapter? 13. Sincerity says that by drawing us into artwork, Sibil “helps us to be better listeners.” (p. 305) Do you feel that Girl Reading helped you to be a better listener? If yes, how so? 1. Visit a museum with your book group. As a group, select a few favorite paintings or photographs, then create backstories for each piece. Try to imagine these stories together, using one another for inspiration and support. 2. Look through the “Women and Girls Reading” pool on Flickr (http://www.flickr.com/groups/518977@N24) before your book group and pick a portrait or two that you particularly love. Share your picks with your group, either on someone’s computer or using printouts. What drew you to some pictures more than others? How did the mental exercise of reading Girl Reading affect your imagination as you flipped through the photo pool? 3. Take Girl Reading-inspired photos of each member in your group. Experiment with locations, lighting, book selections, and facial expressions. Which photos turned out to be the most inspiring and evocative? 4. Enroll in a beginners’ painting or photography class together as a group. While you’re in class, think back on a few of your favorite chapters from Girl Reading and channel the artists in your mind: What would he or she be looking at, wearing, thinking, and feeling? You mention that you drew inspiration for Girl Reading from an illustrated art book called Reading Women. Did you first wish to write a novel and then discovered your passion for women reading? Or did you first wish to create something about women reading, and then settle on a novel as your outlet of choice? I wasn’t proactively looking for creative writing ideas. I initially came across the art book, Reading Women, through an article about it online. They had asked some authors to choose their favorite picture from it and to write a short paragraph explaining why they liked it. I love art anyway, and I was really struck by the range of portraits, by the different styles and media. For example, you had the tomb Eleonor of Aquitaine, made of stone; you had a portrait by Vincent Van Gogh in thick dark blue and red paint on a bright yellow background; and you had a photograph of Marilyn Monroe reading Ulysses in her swimsuit. I thought it was a good article and a great premise for an art book. But it wasn’t until several weeks or months later, that I realized I had begun to see female readers in pictures and in life—on the bus, the train, in a café—and I began to think there could be a novel in this. How did you discover and select your final works of art for this book? Were there any pieces that didn’t quite make the cut? It was a gradual processes and I chose different images for different reasons, arriving at them by various routes. For example, I knew early on that I had to start the novel with a religious painting, because all western art really begins with sacred art. I looked at numerous Annunciations, where the convention to show Mary reading started very early, but Simone Martini’s really stands out because it was so far ahead of its time. I definitely wanted to do a Victorian chapter too, because this is when photography is invented, and the invention of photography is fascinating because painting has to change drastically in response to it; so afterwards you have the impressionists, the expressionists, and so on. The Victorians had very fixed ideas about a woman’s role, and though there certainly were female photographers, it was not thought of as desirable women’s work, which was an interesting premise. There was a practical aspect about the Victorian chapter too. A reading pose in a carte de visite was as much about finding a way to keep the sitter still, as anything else. Angelica Kauffman, however, selected herself as a character! She’s relatively unknown compared to her peers, like Reynolds and Gainsborough, perhaps because no country has adopted her as their own. The more I discovered about her, the more I wanted to write her. I went in search of an appropriate painting by Angelica and happily found one; the scant details about it meant my imagination had free reign. And yes, there was a painting which almost made it into the book but didn’t: a portrait of Elizabeth I, when she was thirteen years old. How many of the portraits in Girl Reading have you seen in person? What sorts of emotions and details did you soak up from your in-person viewings that can’t be replicated by viewing a version online? Not as many as I’d like! Seeing Simone Martini’s Annunciation at the Uffizi bowled me over. The Uffizi collection hangs in chronological order, which really emphasizes how visionary the painting was, how different from what came before it; working that feeling of originality into the chapter was therefore important to me. Infuriatingly, I’ve been to Tate Britain dozens of times but, whenever I go, the portrait by Angelica Kauffman in their collection never seems to be on display. However, there is a wonderful self-portrait by her on permanent display down the road, at the National Portrait Gallery. In it, she looks very approachable, which is consistent with what people said about her. I’ve not seen Pieter Janssens Elinga’s genre, but I’ve been lucky enough to see plenty of paintings from the Dutch Golden Age. From those, you get a real sense of the lifestyles and tastes of the people who feature in them and owned them. Seeing art in real life, compared to a digital reproduction, really brings home to you the skill of the artist. Images online are shrunken and sanitized, but up close in a gallery, you start to see the brushstrokes, the human effort involved, the ingenuity. The real artwork is usually far more impressive and fragile-looking. You imagined several of the art pieces featured in Girl Reading. Did you draw actual sketches or paintings of these pieces, or did they stay in your head? Did the imagined art come to you all at once, or did you create them piece by piece in your mind? I didn’t draw them—I’m hopeless at drawing! I’ve seen lots of artwork of female readers ,and I feel that all those images must have taken hold in my subconscious to a greater or lesser extent. Sometimes real artwork emerges in the book as a character, like Jurina or Sinclair, and some of the featured artwork in my novel doesn’t exist at all, like the 2008 photo in a bar. However, Jeannine’s commute into work on the London underground is very close to some portraits shared on Flickr and the real life experiences of many people on the tube and subway every day. I believe that when you look at art, you really see what you want to see, you project your own feelings and experiences onto it, the way psychologists use inkblots. I couldn’t help but imagine what was taking place “off stage” and it didn’t feel difficult or forced to me to invent pictures to go with these ideas. I think the most audacious creation in the novel was taking a real Victorian sculpture, The Libyan Sibyl by William Wetmore Story, and dropping her into a future context. How much research did you do for this book? How did you decide what parts of your stories should be researched and fact-checked, and what parts could be purely imagined? I did a lot of research to ensure the context and details were true, for example, in the Amsterdam chapter, when the demand for fine art was a byproduct of prosperity in the merchant and professional classes. As I already knew a bit about Dutch painting, I wasn’t starting completely from scratch. But I knew absolutely nothing about Victorian photography, so that involved a significant amount work; not only was there the technical side to become familiar with, but also the culture of cartes de visite as a fashionable pastime and the lowly reputation of photographers themselves. The fiction writer’s top priorities are getting the story and characters right, but the writer of historical fiction should also use facts to help create atmosphere, and as inspiration for dramatic events. If you could live for a day as any character in Girl Reading, whose shoes would you step into? If someone were to write a chapter inspired by a photo of you reading a book, what would you want the photo to look like? Where would you be, and what would you be reading? I don’t think I would make a very interesting character in a book, so the author would have to use some artistic license! But I read A Room with a View by EM Forster when I was in Florence and still in the planning stages of Girl Reading. There’s a fabulous restaurant on the Piazza Santa Croce, perhaps we could go there? However, a more realist portrait would be me reading in bed, with arms and pillows at strange angles. You describe on your website the difficulty of having to share your writing with the world, once you’ve signed a book contract. Has this process gotten easier for you over the past months and years? Yes, thank goodness. It’s a big transition, from your work being completely private, to it being something which other people have a stake in. I’ve been extremely lucky to work with supportive publishers, whom I trust, so that’s helped. Now I feel grateful that Girl Reading has taken on a life of its own and is making its own way in the world. This is your debut novel. Do you have plans to write more? You’ve worked in the office of a member of Parliament. How did you channel that experience into writing the “Reader in a Shoreditch Bar, 2008” chapter? Normally I was in the constituency, but on those occasions when I worked at Westminster, I was very struck by the feeling of isolation. There are lots of people around whom you don’t know, don’t see, and have no reason to speak to. It’s different working in a government department, or at a party headquarters, which would be much more sociable, but the MP’s offices themselves are surprisingly cut off. I think that can also be true living in a big city generally, where there are always people around, and yet it’s very easy to find yourself on your own. I really felt for Jeannine when I wrote her, because she is capable of doing almost anything she wants, and yet she’s missed some opportunities, made a few bad choices, and now she’s stuck in job and a relationship that are no longer satisfying her. I also feel this is a relatively recent predicament which working women find themselves in; the idea that no matter what we’ve achieved so far, we should be aiming higher and achieving more. You’re in a book group yourself. What’s your favorite part of book club? If you had to pick a few great reads for book groups, in addition to Girl Reading, which titles would you recommend? Part of the pleasure of a book group is just seeing everyone, having a catch-up and a drink together. But I do like it when a book provokes strong feels of support in one part of the group, and skepticism in another, so we can get a really lively conversation going about it. Being surprised by a title someone else chose is always lovely. There are two which other members of my book club forced me to read that were truly outstanding: Ragtime by EL Doctorow; and In Cold Blood by Truman Capote. And I heartily recommend Beyond Black by Hilary Mantel, and Miss Garnet’s Angel by Salley Vickers, both of which I think would work well in a book club setting. 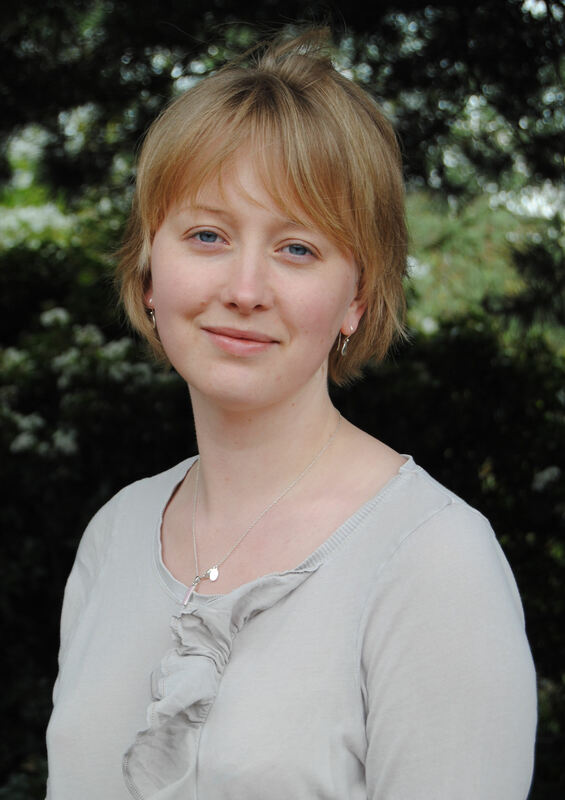 Katie Ward was born in Somerset in 1979. She has worked in the public and voluntary sectors, including at a women’s refuge center, in the office of a Member of Parliament, and in various community-based projects. She lives in Suffolk, England, with her husband and two cats.